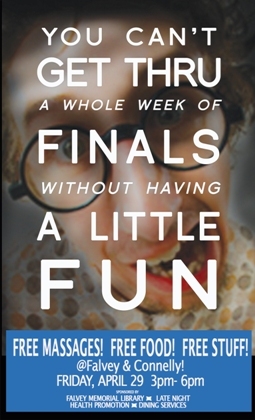 Stop by Falvey Memorial Library or the Connelly Center on Friday, April 29, from 3:00-6:00 p.m. for some finals fun! There will be free massages, food and stuff! It’s the perfect way to take a break from studying and to relieve your stress. This event is sponsored by Falvey Memorial Library, Late Night, Health Promotion and Dining Services. Come to the first floor lounge.